Every team has seen the field now in Major League Lacrosse and a few story lines are starting to take shape. New York is head and shoulders above all other teams after two weeks. The Lizards spread the ball so well and had eight different goal scorers, six with multiple goals. Greg Gurenlian has dominated face-offs once again establishing himself as the gold standard in the MLL. Drew Adams is off to a hot start in cage as well. More importantly, the Lizards defense, led by veteran Brian Spallina, has an identity as a tough, physical group which makes them the early favorite. Rochester struggled at the X for the second straight week and may be the cause for them to struggle this season. James Carroll had a rough Week One and Adam Rand was not much better Sunday. Rand is a .488 career guy, but Rochester really needs a upgrade to an otherwise strong team. They were also missing half the squad they will field later in the season so it is still tough to gauge how good they will be come August. I was expecting a little more from Florida. Stan Ross will be hard pressed to find any positives from his team’s performance. The defense was weak although Brett Queener did his best to keep his team in the game. Coming off an outstanding rookie season, Kieran McArdle led the team with four goals, but took 14 shots to get those goals. 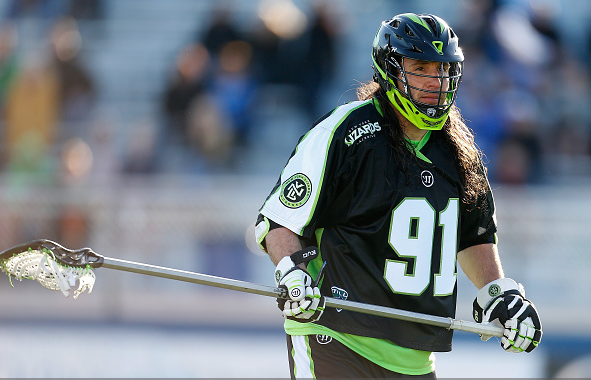 Legend Casey Powell was held to just one goal on seven shots. As a team, the Launch scored eight goals on 26 shots on goal. They missed the cage on 20 other shot opportunities and took a goose egg on four man-up opportunities. Chesapeake looked solid in their opener in 2015, but I’m having a hard time deciding how good it was because Florida was so bad. Ben Rubeor rebounded nicely after struggling last season. Matt Striebel, Jovan Miller, and Matt Danowski all played well and should provide a huge upgrade to the Bayhawks. The Ohio Machine have played seven good quarters out of eight so far this year. If they had some better play at the X, they could easily be 1-1. The Machine were 6-30 on face-offs yet lost by one at the last second to Denver. On the other side, not sure if I should be concerned about Denver. Jesse Schwartzman is off to a slow start and the Outlaws look out of synch on offense. Sometimes, these problems happen in the first few weeks of the MLL season though. Greg Gurenlian, New York: The Beast put on a clinic in suburban Rochester Sunday winning 23 of 26 face-offs and grabbing 16 ground balls. He looked like he was playing a JV team and was the major reason the Lizards built an 11-point lead in the first quarter. Anthony Kelly, Denver: Any other week, Kelly’s performance at the X would be a huge story. Unfortunately, his 24-30 effort against Ohio was only second best. The Outlaws needed all of those extra possessions to beat the Machine. Tyler Fiorito, Chesapeake: Fiorito making only his ninth pro start turned away 18 of the Launch’s 26 shots. Any time a goalie gives up eight goals or less in a pro game deserves a shoutout! Brett Queener, Florida: Queener gets a game ball merely for still being upright after getting drilled with 44 shot, 37 shots on goal. He was left on an island and as frustrated as we was, kept the game from getting out of control. Did I mention he scored a goal as well? Goalies scoring is extremely rare, but Queener is the master. 1- New York (2-0). The Lizards certainly look like they are setting themselves apart from the rest of the league. Complete team win vs. the Rattlers. 2- Rochester (1-1). They got hammered 11-0 in the first quarter, but bettered the Lizards 9-8 in the last three quarters. Still, the first quarter was very concerning despite missing so many starters. 3- Chesapeake (1-0). Is their offense that good or did they get fat off of a bad Launch defense? 4- Boston (1-0). The new look Cannons were impressive in their first game. How will they follow up? 5- Denver (1-1). Almost gave away the game vs. Ohio despite controlling possession. 6- Ohio (0-2). The Machine got owned at the X again, but almost beat Denver. They need a lot more production out of Steele Stanwick. 7- Charlotte (0-1). The Hounds got a break this week and will need another big game from Pierce Bassett against Boston. 8- Florida (0-1). The Launch are going to be hurting all season if their long poles don’t step up. Brett Queener can’t be teed off on every single week. Shooting under 20% on offense is not much better. Brendan McDaniels is a color analyst for the MLL Television broadcasts and can be seen May 3rd at 1 p.m. as the Rattlers host the Launch on ESPN3. Follow Brendan on Twitter @BMcDTWCSports.